Having failed to score tickets to the Flyers-Bruins game played at Fenway on New Year's Day, I settled for a Boston University-Boston College match-up played there one week later. But it hardly felt like settling. 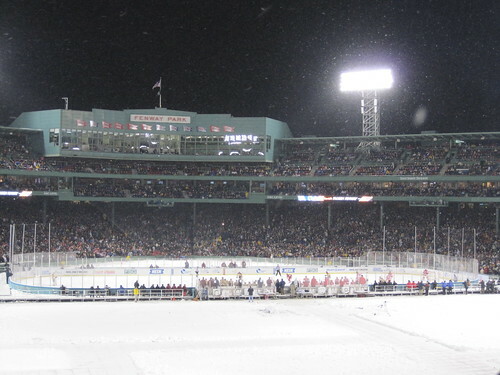 If anything the BU-BC game had a much more "outdoor-hockey" feel than the NHL Winter Classic had. Blowing snow gave Fenway a mystical, snow-globe feel, and the college-game atmosphere was fun all night and electric at times. Decked out in BC gear, I continued to be a jinx at big sporting events for teams I support. After the Fiesta Bowl debacle, I witnessed BC slog TCU-style through two awful periods and spot BU a 3-0 before coming back furiously in the third and just falling short of tying the game. Final score: BU 3, BC 2. Of course, I had no real emotional investment in this game the way I did in the Fiesta Bowl, so the "loss" didn't hurt at all. In fact, tonight was a great night overall, aside from temperatures in the 20s that had me worrying that I'd lose a toe or two to frostbite. Fortunately I came home with all ten. And my friends and I made it through the whole game, which is more than I can say for probably 50 percent of the people in attendance. (BU brought more fans than BC, but BC fans stayed longer than BU fans did for the most part.) Hey, we're New Englanders... Actually, we're not (none of us is, in fact), but we showed our winter toughness tonight.